This painting of two dancers and their long-suffering servants fetched the highest price ever for a Scottish painter. Here is a further selection of the artist's work from the BBC website. The most famous painting by Scottish artist Jack Vettriano has smashed all expectations, selling for £744,800 at auction. have trouble finding him in public collections. Last edited by Stuart Sweeney on Tue Oct 04, 2005 2:59 am, edited 2 times in total. I kind of like it... I dunno why, I guess becuase it expresses how people can be inconsiderate of others at times. Like cell phones in a resturant. Thats what first popped into my mind when I saw it. The first thing that popped into my mind was how wet sand is difficult to dance on. Heh, I have to respond to this one. I for one have a print of this particular painting hanging in my room. I love it just because the way the couple is portrayed. They would dance even if no one was there to hold umbrellas over them. They dance together as an expression of love and to me they feel as if they're alone. I don't think the servants are long suffering. In some households butlers and housekeepers have a longstanding loyalty to their employers especially if they've worked for them for a long time. It looks to me as if it's concern that makes them want to shield the couple with the umbrellas from the elements but the couple's love expressed through a waltz makes them alone in this picture. It's "bad" in the sense of naughty. A piece can be a masterwork and still be naughty; the naughtiness can even be a part of its appeal. Some masterpieces are too naughty for their time (eg: Mozart's Magic Flute). Valid point...perhaps, then, the adjective "naughty", and not the term "bad", should be modifying the art in question? Just to avoid further confusion? Am I a complete bore? 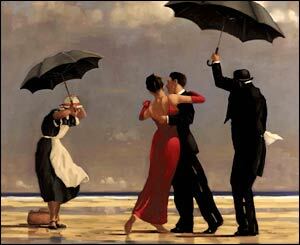 ARTIST Jack Vettriano confirmed last night he used images from a reference book to create some of his most famous work. The Record revealed yesterday the astonishing similarities between Vettriano's characters in paintings and photographs posed by models in a cheap guidebook for illustrators. JACK VETTRIANO'S agent accused another painter of copying his work - even though Vettriano himself based some of his greatest paintings on images from a book. The Record told yesterday how several works by Britain's best-selling painter bear striking similarities to images in an artists' teaching guide. The Independent covers this story in full with astonishing pictures of the originals from the reference book reproduced beside some of Vettriano's pictures. I think from now on Mr V. will be considered more of a plagiarist than the art critics' bête noire. I want to discuss the concept of dancers' having servants.